The FFA Centre of Excellence fought back twice from two-goal deficits on Saturday as they grabbed a 3-3 draw with 10-man Canberra FC. The visitors got off to the perfect start in just the fourth minute, as Daniel Subasic rose highest at the back post to thunder home a header and give his side the lead. Canberra FC looked to take control of the match from there, and Thomas James doubled the advantage just over ten minutes before the break as he finished tidily past the goalkeeper. The hosts trailed by two goals at the break but came out of half-time looking to change the game, and Mirza Muratovic pulled one back nine minutes in as he picked up his sixth goal of the season. With the game poised evenly and just over half an hour to go, it was there for the taking, and James struck next with just 18 minutes to go as he slotted his tenth of the campaign and restored the two-goal advantage once more. But the youngsters were not done; Lleyton Brooks halved the deficit again just three minutes later and Canberra FC saw Michael Mensah dismissed for his second yellow card with 14 minutes left. The home side attacked with their opposition now down to ten, and Jay Barnett set up a tense final few minutes as he scored with eight to go, but neither side could break the deadlock as they settled for a draw. Canberra will host Gungahlin United next weekend in a big clash, while the Centre of Excellence take on Belconnen United at McKellar Park. Woden-Weston picked up their first win and first clean sheet of Season 2017 on Saturday with a thumping 5-0 win over Monaro at Duncan. Martin Deng got his side off to the perfect start after just nine minutes as he fired home, and he doubled the advantage after 24 as he scored again. The visitors dominated a shell-shocked home side, who contributed with defensive lapses that continued to cost them. Ibrahim Khodary netted a fine goal in the 28th minute, and suddenly Wanderers were cruising three goals up inside 30 minutes. Panthers managed to plug the gaps as the half wore on and the deficit remained three goals at the break with Woden-Weston on track for their first win. The second half began in much the same manner as the visitors hunted for more goals and Monaro struggled to create any chances of their own. Daniel Crkovski was next to net as he continued his fine scoring form with a tidy finish, and the pressure from Tony Olivera’s side was unrelenting. Manda Phakedi rounded out the scoring with just three minutes to go as he fired home to complete a fine victory on the road. Woden-Weston now look ahead to the FFA Cup against Canberra Olympic before a league clash with Tigers next weekend, and Monaro face Gungahlin in the cup and travel to Tuggeranong next Sunday in the NPL. Gungahlin United leapt into the PS4 NPL top four on Saturday, as a dominant second half handed them a 3-0 win over Riverina Rhinos at Kaleen. A penalty from Misko Naumoski and goals to Jack Green and Frano Blazevic got United across the line after an even first half. Canberra Olympic jumped to the top of the PS4 NPL standings on Sunday afternoon with a convincing win over Tuggeranong United at Greenway. The home side had the perfect chance to take the lead early when they were awarded a penalty but could not convert, and Olympic were off the hook. The visitors made good on that chance after 20 minutes, as Tim Bobolas tucked home a header from Michael Reeve’s corner and his side never looked back. Stephen Domenici was always going to get in on the scoring, and he grabbed his first after 34 minutes as Jeremy Habtemariam made his way down the wing before cutting back to find the striker in the box. Olympic held their 2-0 lead at the break but continued to push for more goals after half-time, and Domenici scored once more from the penalty spot just ten minutes in to effectively seal the match for the visitors. Tuggeranong continued to push however, and grabbed a goal back with four minutes to go. Nikolaos Kalfas converted from a penalty to give them a fighting chance, however it was not to be as the final minutes petered out. Both sides face cup action this week as Olympic take on Woden-Weston and Tuggeranong await the details of their fixture with the Riverina Rhinos. Tigers FC jumped back into top four contention and blunted Belconnen’s top two pursuit with a 3-0 win over United in Cooma on Sunday. A cagey opening start saw both sides sitting back, neither of them wanting to commit forward for fear of being opened up on the counter. But Tigers opened up the scoring after 31 minutes as Daniel Barac came inside from the wing to fire past Finn Jurak in the Belconnen goal. Tigers continued to push the envelope with a one-goal advantage, and captain Goran Josifovski gave them the perfect half-time result as he scored to double the lead in the 45th minute. Down two goals at the break United were forced to come out attacking, but struggled to make headway against a strong Tigers defence, and were always up against it throughout the second half. And as they pushed forward Tigers bit back, and Nicolas Abot all but sealed the three points with just over twenty minutes to go as he fired home Tigers’ third. The win leaves Tigers just three points outside the top four ahead of cup action this week, while Belconnen sit third, but now four points behind second-placed Canberra FC. 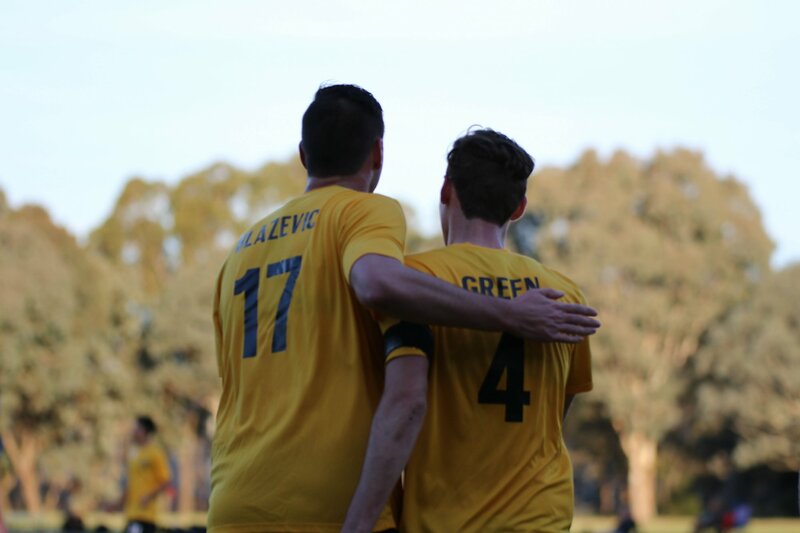 Caption: Frano Blazevic and Jack Green of Gungahlin United celebrate during the 3-0 win over Riverina Rhinos on Saturday. Photo Credit: Lawrence Atkin.